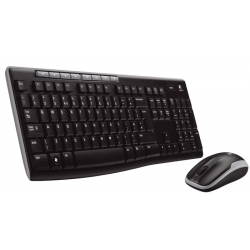 Price for LOGITECH COMBO MK260 DESKTOP WIRELESS KEYBOARD AND MOUSE in Riyadh, Jeddah, Khobar (KSA). A compact keyboard-and-mouse set that gives wireless convenience. Youâ€™ll experience virtually no signal loss up to 10 meters away with Logitech Advanced 2.4 GHz connectivity. You can go for months without battery hasslesâ€”24 months for the keyboard and five months for the mouse.